British troops help rescue baby elephant and the Environment Secretary on the Natasha Ednan-Laperouse inquest. Today’s Daily Express includes a double page spread on the exploits of British soldiers working with African Parks’ rangers in Malawi to rescue a baby elephant trapped by a snare. The Express’s defence editor, John Ingham, reports that the elephant was found by a patrol of African Parks rangers with their British Army mentor, Lieutenant Alex Wilson. The UK Government is spending £26million on combatting the Illegal Wildlife Trade between 2014 and 2021. Later this month, the fourth international Illegal Wildlife Conference in London (11/12 October) will bring together 82 nations and a range of organisations and political leaders from around the globe to shine a spotlight on this vile trade. This follows the ground breaking London 2014 conference on the illegal wildlife trade, and subsequent conferences in Botswana and Vietnam. Defra funding in Malawi (£600,000 between 2017 and 2020) has created a base of strengthened parks and the group of soldiers express their pride in helping to secure Malawi’s natural heritage. In addition to Malawi, soldiers from the British Army have undertaken counter-poaching training in Gabon and Uganda during 2018. The gestation period for an elephant is two years, and the calf has to be with its mother as long as a human child. 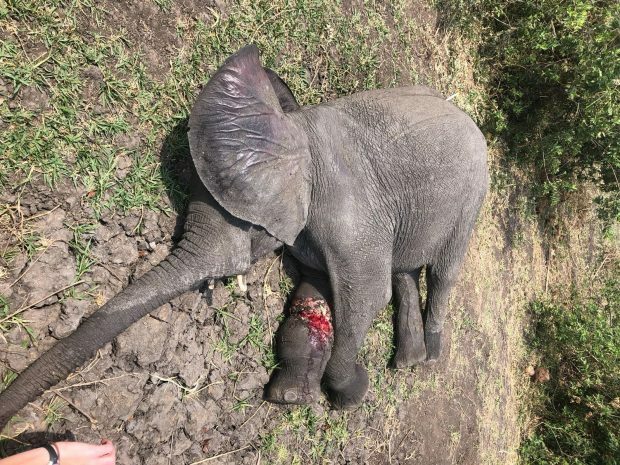 Losing a baby elephant is like losing a child, so to be able to keep this one alive and in its herd with its mother was a fantastic win for us. Wildlife crime does not respect borders. We must share skills and expertise worldwide. The Malawi enforcement project demonstrates the global leadership we set out in the 25 Year Environment Plan. We are introducing one of the world’s toughest bans on ivory sales. Environmental Crime, which includes the illegal wildlife trade and illegal logging, is the fifth most lucrative serious organised crime and is estimated to be worth up to £17billion a year. The criminals who run this trade do more than damage wildlife - they use networks of corrupt officials and agencies to undermine sustainable development and the rule of law, bringing misery to local communities. Money made from this trade is used by criminal networks. Over the weekend there was widespread print coverage of the inquest’s findings on Friday 28 September into the death of the teenager Natasha Ednan-Laperouse after she suffered an allergic reaction to a Pret A Manger baguette. The coverage centred around the family’s comments stating that Pret played “Russian Roulette” with their daughter’s life and the need for reform of the “inadequate” food labelling laws. The Environment Secretary’s shared the below statement on Friday to offer his condolences to her family and to make clear that work is already underway to review our approach to food labelling and give consumers more information. All EU Member States have the ability to introduce national measures and the Environment Secretary intends to notify the EU commission of our intention to do so. Following this, we will be able to consult after three months. This is a deeply upsetting situation and my heart goes out to the family of Natasha Ednan-Laperouse. We are currently reviewing our approach to food labelling to give consumers more information. A critical part of that is looking very closely at how we can improve and strengthen domestic regulations to make sure all UK consumers have complete trust in the food they are eating.